Don’t mind us while we devour these tasty little mushrooms of joy! Earthy, tangy and full of flavor, this healthy Deli-Style Marinated Mushroom Salad is perfect for mushroom lovers everywhere. These beauties soak up aromatic Italian tangy flavors making it the perfect topper on salads, as a side dish, or nestled in sandwiches or wraps. 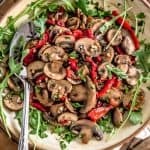 Tasty cremini, button mushrooms, garlic, and roasted red peppers, are marinated in a bomb dressing that will remind you of those delicious deli-style salads from your favorite local Italian deli. It is sure to put a smile on your face, making it this week’s awesome Whip It Up Wednesday recipe. Slice the mushrooms and place in a large nonstick skillet with 2 Tablespoons tamari. Sauté for 9 to 10 minutes to allow the mushrooms to release their water, then add the finely minced garlic and roasted red pepper strips, sauté for one minute. Remove from the stove to cool and place in a bowl. In the meantime, place all the marinade ingredients into a small bowl, whisk well to combine. Set aside. After the mushrooms have cooled, then pour the marinade over the mushrooms, garlic, and red pepper strips and toss until everything is coated with the marinade. Sprinkle with chopped flat leaf parsley. Serve at room temperature or refrigerate. Serve as a tasty sandwich topper or as a yummy side salad. If refrigerated, before serving, remove from the fridge and allow to sit for 30 minutes. This allows the seasonings to wake up. *Roasted Sweet Pepper Strips: We found roasted red pepper strips at our local grocery store under their own brand. You can also buy Mancini Roasted Sweet Peppers and cut them into strips about ½ inch wide and 2 inches long. They are beautifully sweet, Whole Food Plant Based compliant, and have excellent flavor; however, you can roast your own peppers if you’d like. Place the oven rack near the top and set the oven to high broil. Place two small red bell peppers or one large on a baking sheet and broil on high, turning occasionally until the pepper is soft and the skins are dark (black). This takes about 10-15 minutes (or longer depending on the size of the peppers). Immediately place the pepper in a glass container and cover with plastic wrap or a tight-fitting lid to sweat the pepper. This helps with removing the skins and seeds. Set aside for 10 minutes to cool. take the cooled pepper and pull the stem off and discard; then tear open one side of the pepper and scoop out the seeds (discard), then lay the pepper out flat, charred skin side up, then pull and scrape off the charred skins and discard. Then cut into thin strips. *Miso: We usedMiso Master Organic Mellow White Premium Lite Miso, Certified Gluten Free. Miso really lends itself to balancing flavors when you don’t use oil. If you are going to live the Whole Food Plant Based lifestyle, then you will quickly find that miso is your friend. Miso is simply a paste made from fermented soybeans, barley or rice malt. We use a gluten-free mellow white miso. It is Whole Food Plant Based compliant, and most grocery or health food stores carry it these days. You can find it in the refrigerator section. A lot of Vegans and Whole Food Plant Basers call it “the secret weapon” because it really brings that rich umami flavor forward in a lot of dishes. Since we discovered it, we use it a lot. Simply because it really adds something special to our dishes that you just can’t get with other ingredients. It has a long refrigerator shelf life because it is fermented. So, if you can’t find it locally, we suggest that when you are taking any trips out of town, find a store that carries it, take a small ice chest and stock up.